Two-factor authentication is an added layer of security that ensures you are the only one who can log into your SproutVideo account with your credentials. Two-factor authentication requires you to enter your username and password as well as a unique token generated by a 3rd party application on your phone. Navigate to your profile and click on ‘Security’. Select the ‘Enable Two-Factor Authentication’ option. Once you verify your password, you will need to install a two-factor authentication (2FA) application on your phone. We suggest Authy, Google Authenticator, 1password, or LastPass Authenticator. Once the application is downloaded, scan the barcode on the page to generate an authentication code, or enter the text code provided into your app. Then enter the six-digit code generated by your 2FA app and click on ‘Verify Code’ to continue. 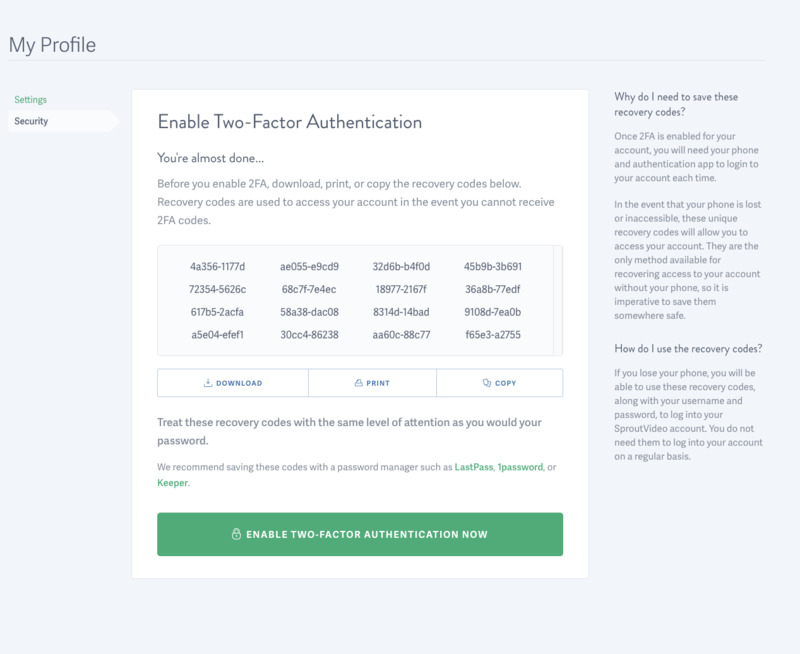 Before finalizing your 2FA set up, you will want to save a copy of your recovery codes. Recovery codes allow you to access your account in the event that your phone is inaccessible, or you are unable to provide an authentication code from your 2FA application. Be sure to save, download, or copy these codes to a safe place. Treat them like your account password, since they can be used to access your SproutVideo account. We suggest a password manager like LastPass, 1password, or Keeper.